Field Trips are available year-round Monday through Friday during Museum hours, 10am-5pm. Note: some galleries are closed periodically for exhibition installation and the Chadwick Studio is open seasonally (April-October). Our Field Trips combines art, history, and nature, and can be geared for students of all ages and grade levels. The Florence Griswold Museum is one of the premiere destinations for school groups of all ages. From preschool-aged children to high school students, the campus is a rewarding experience for all hands-on, minds-on educational experiences. Field trips are coordinated by our Museum Educator working with enthusiastic volunteer educators to combine the art, history, and nature into one remarkable visit. Upon arrival, classes are divided into smaller touring groups and rotate between the three activities outlined below. The field trip is approximately 2 hours and 15 minutes. Please note: many groups also choose to stay on campus for a picnic lunch (weather permitting) or eat in our climate-controlled Education Center. Cost is $8 per student and includes admission, guided tours, facilitated art lesson, and all art supplies. Groups receive 1 FREE adult admission (teachers or chaperones) for every 15 students in the group. Additional adults are $8 each. Visit between November 15 and April 15 and pay only $6 per student. Book now for Wee Faerie Village – Faerieville USA from September 29 through October 28. During this event, thirty miniature faerie installations will be installed in various nooks and crannies on the Museum grounds. This is in addition to the historic Griswold House and new art exhibitions. There are two popular options for you and your students exciting outdoor exhibit as well as the great art and history on view at the Museum. advance of your date. Please note that tour dates sell out fast. You can also tour Wee Faerie Village on your own with your class and chaperones using the village map. And thanks to a grant, students 12 and under are admitted free to see the Wee Faerie Village. For this outside-only option, adults are charged $5. A pre-visit packet will be sent in advance of your date. Contact David D.J. Rau at (860) 434-5542, ext. 115 or david@flogris.org for this option. To reserve a date, or for more info, contact: Julie Garvin Riggs (860) 434-5542, ext. 113 or 123, or julie@flogris.org. This student-centered guided tour introduces students to Miss Florence and the Artists of Old Lyme. Miss Florence was a sea captain’s daughter who opened her home to painters traveling from New York and elsewhere. These artists became the Lyme Art Colony, a group famous for painting landscapes in both the Tonalist and American Impressionist styles. A visit to the House shows where these important artists slept, ate, and played games when they were not out in the landscape making paintings. The tour introduces an artistic vocabulary through an investigation of the collection including over 40 pictures painted on the doors and walls of the historic interior. Field trips also include a visit to the galleries to investigate the current exhibitions on view in the Krieble Gallery, the Museum’s state-of-the-art facility on the banks of the Lieutenant River. The Museum’s educators use a variety of learning-to-look strategies with your students to enhance their visual literacy using remarkable objects from the Museum’s collection and often on loan from other institutions or private collections. 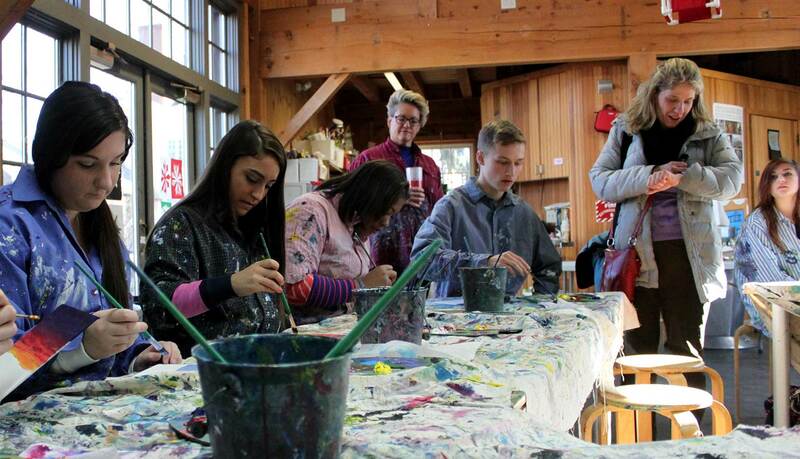 During their visit, students step into the role of an Old Lyme artist. 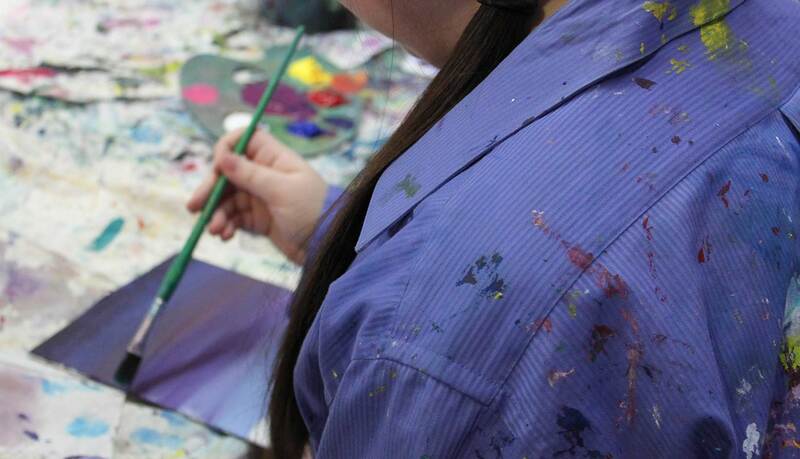 This hands-on activity begins with an introductory lesson about the tools and techniques of the American Impressionists in the Education Center. Students then paint a landscape using authentic artist’s materials (acrylic paints, palette, brushes, canvas board, smock) down by the river or in the Education Center (inclement weather option). Each student will leave with a completed 8 x 10 landscape perfect for an in-class exhibition. These can be substituted for either Activity I or II above, or added to the schedule (requires additional time). Visit the historic studio of American Impressionist William Chadwick and learn more about the painting tools and techniques of the Lyme Art Colony. 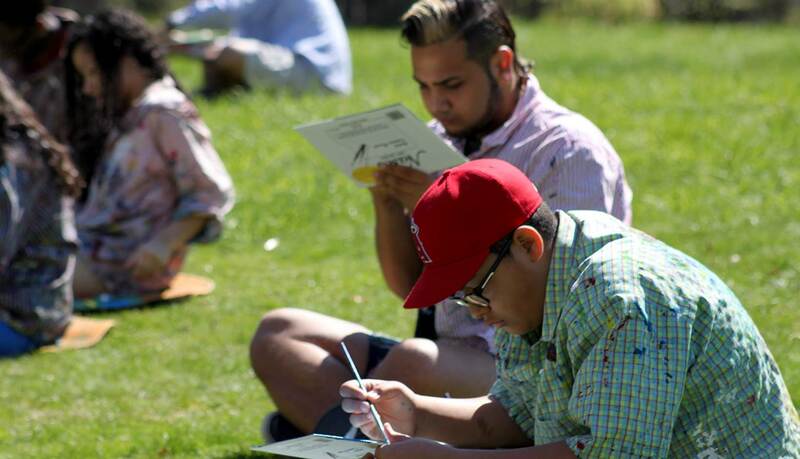 This program strengthens the students’ artistic vocabulary and understanding of the daily activities of an artist in Connecticut, and prompts discussion regarding the trials and triumphs of the plein-air painters. Visit the exhibition An American Place: The Art Colony at Old Lyme in the galleries on the second floor of the Griswold House for an interactive lesson on the two dominant painting styles enjoyed at the Lyme Art Colony. Learn the characteristics of both Tonalism and American Impressionism through the examination of stellar examples in the Museum’s collection. Students walk the grounds of the Museum to discover the places the historic artists painted and played. They can study the architecture of the Griswold House before walking through the historic gardens and orchard, discuss the contemporary sculpture “The Anticipator” by Matthew Geller, ending down along the banks of the Lieutenant River to learn its role in commerce, ecology, and as an important subject for the artists. Each session: $12 per participant (additional siblings $10) and includes one free museum admission for parent or guardian. Classes limited to 25 students. Call the Museum at (860) 434-5542 to schedule. Your class will be divided into four smaller touring groups and rotate between the activities. Please consider how to divide groups up evenly before arriving. Please review with your students that food, drink, chewing gum, ink pens, cameras, cell phones, cell phones used as cameras, and water bottles are not allowed in the Museum. 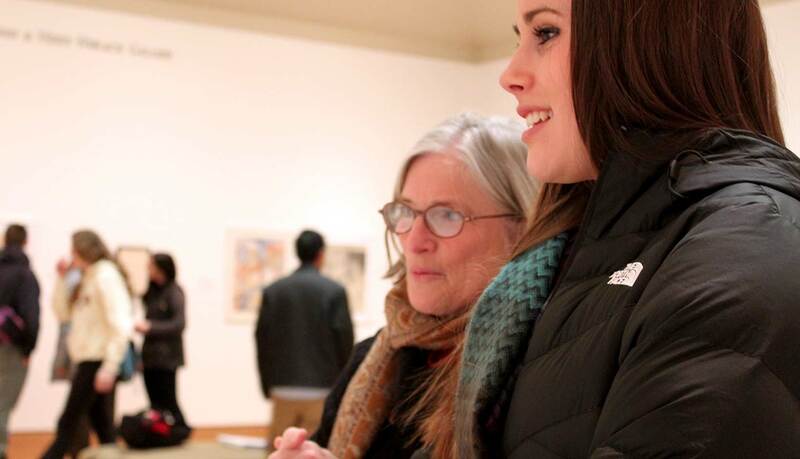 Remind your students that not to touch any of the paintings, furniture or sculptures on view. Please explain that even the cleanest hands leave fingerprints that are filled with salts, oils, and acids that are damaging to works of art over time. While at the Museum students should extend all courtesies of the classroom. Common sense rules such as talking only one at a time, raising hands to be called upon, and using indoor voices are all appropriate behavior when touring the Museum. You might want to brainstorm about appropriate behavior when visiting a museum. Often, students have great ideas about how to best enjoy their visit. Remind students that photography in the gallery is not permitted, but they might want a camera to capture the beauty of the historic house, gardens, and river. Teachers may take photographs of the tour in action for documentation, but not individual works of art (even without a flash). Divide your class into the number of equal-sized groups outlined on the confirmation form with at least one adult accompanying each group of students. Having the students wear nametags is ideal. This allows the educators to call on them by name. There are several pre-visit activities available on this site. For starters, reading the “History of Miss Florence and the Artists of Old Lyme” to your class followed by a discussion using the Think Fast Questions will prepare your students for the experience.